Rachel Done was awarded a work experience at one of the busy London shops, Stringers. I was given a work experience placement with Stringers, London in November 2017. 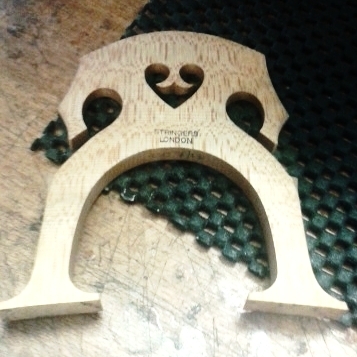 The objective was to see the speed and quality of violin restoration in a busy London shop. The shop was going through a particularly busy period as it was expanding into additional premises along with moving the workshop so that all the luthiers would work together. Before the placement I met with Ian Byrne Brito and Cecily McMahon, the two managers of the London shop. They explained the ethos of the shop and the commercial importance of repairs being done within set times. 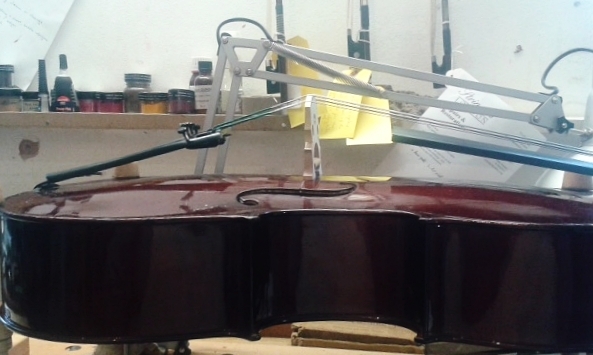 Most of the work was on cellos alongside a significant number of bow repairs and rehairs. When we started work in the workshop, Antoni Ruschil helped me look at some minor violin repairs on student instruments. Antoni gave me many useful tips as we took some detailed measurements of the bridge position, bass bar and the soundpost. He explained the importance of these regarding the tracking of tonal adjustments with new setups. Before starting to fit the bridge, we looked at the bass bar, and its importance regarding the bridge width. We looked through some blanks and chose a bridge according to its grain and medullary rays. Then traced the fit onto the feet and trimmed some excess wood off before starting to fit it to the arching. After getting the heights correct, I thicknessed the bridge. With that done, I started to trim the bridge trying my best to copy the Stringers style. With Antoni’s guidance and assistance, I managed to get a good understanding of why he shapes a bridge in this way to help spread the sound from the strings into the instrument. Antoni then showed me how he finishes a bridge using oil and burnishing the surface. With the bridge finished, I set the violin back up. I was then able to work with Colin Cross looking at cello set up. I had had no previous experience of working on cellos so found this extremely interesting. The shaping of the bridge was particularly interesting.During my time at Stringers I also witnessed the type of repairs the luthiers were doing and the speed that they worked at. All of this work was complimented by watching them look and comment at instruments brought in for valuation. As were the discussions of what work should be done in-house and what ought to be sent to external repairers for quotes. Instruments were also brought in for minor sound adjustments and the previous discussions regarding the tracking of tonal adjustments were useful here. I was also lucky enough to watch Juliane Schanzenbach, the senior bow restorer, at work. The different techniques she used were really interesting as was the way that any issues with bows brought in for repair were documented.